Two state senators have to bridge the urban-suburban divide . . . within their own districts. It has been a whirlwind week in Albany as the state enters a new period of Democratic control. That has meant that issues once as delayed as a Sunday F train are now flying forward. Voting reforms like early voting and simpler registration? Protections for LGBTQ New Yorkers? No more LLC loophole to hide political giving? All passed by both chambers of the State Legislature. And Gov. Andrew Cuomo’s budget address on Tuesday cited a number of big-picture progressive priorities, such as legal weed. Republicans are outnumbered and in disarray in the Capitol, and there’s more room for easy wins to come for Democrats. But if partisan divisions are less consequential this session, that doesn’t mean everyone’s in agreement. Consider the perennial urban-suburban divide that animates state politics in New York. To take the measure of that divide, amNewYork spoke to two Democratic state senators who are bridges of a sort. State Sens. Jamaal Bailey and Alessandra Biaggi both represent parts of the Bronx and Westchester County, and their districts are the only ones that include parts of NYC and a surrounding suburb, according to the state Board of Elections. Both senators noted issues of continuity in their districts. “I like to think of more common areas than divisions,” said Bailey, a second-term legislator and city native who went to the Bronx High School of Science and interned for state power broker Carl Heastie. Newly elected Biaggi said the bills that have already passed in Albany like voting reforms are commonsense issues of wide import to her constituents. But there are clear and enduring differences across the city line. Take property taxes. This is not an issue that tends to get hearts racing in swathes of NYC, partially because there are more renters and partially because property taxes are lower than the surrounding suburbs. But Biaggi, who grew up on the suburban Pelham side of the district, said she’s sensitive to the “alarming number of people who can't afford to stay in their homes because of high property taxes" just outside of NYC. So she supports making permanent a 2 percent cap on property taxes. Bailey didn't commit to a permanent cap, but said that property taxes are a top issue in Mount Vernon. He says he generally defers to his Westchester County colleagues such as Senate Majority Leader Andrea Stewart-Cousins on county issues. Stewart-Cousins, the first female majority leader in state history, has spoken at length about balancing city and suburban issues to hold together her Democratic caucus, and she recently said she favors a permanent cap. School funding is another traditional nest of vipers for political infighting between city and suburban districts. The senators sketched out unsurprising positions on that front, suggesting that the Bronx could use more attention or funding, while sidestepping the idea of whether or how that would impact suburban districts. “It doesn’t have to be the Hunger Games,” said Bailey. With money and children’s education at stake, good luck. But a sign of changing Albany winds could be seen in the last major suburban-urban issue: congestion pricing, the idea of tolling entry to parts of Manhattan to reduce congestion and raise money for the MTA. Lawmakers from districts with many drivers have typically been cagey, because politicians don’t tend to be big fans of making their constituents pay new tolls. But he added that he’d like to see a so-called “lockbox” as part of the tolls, guaranteeing that the money would go to transit. “I am fully understanding of the need to raise revenue to fix subways and buses,” he said. 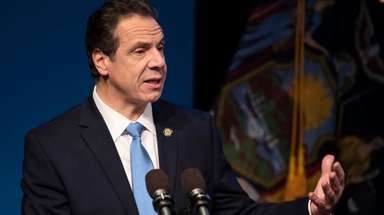 There are a thousand details to work out, but the broad issue is close to becoming consensus, from car-loving Cuomo down to recalcitrant legislators. Biaggi, for example, is all in for congestion pricing. Unlike many longtime legislators but more like some of her constituents, she says she doesn’t own a car (she does use one). Changing times indeed for Albany, where politicians’ parking spots are prime.